Greening the Beige is dancing with excitement and pleased as peaches to announce DESERT DANCE, a Benefit Without Borders event, coming up this Saturday, July 18th! All photography display works are available for sale by silent auction. 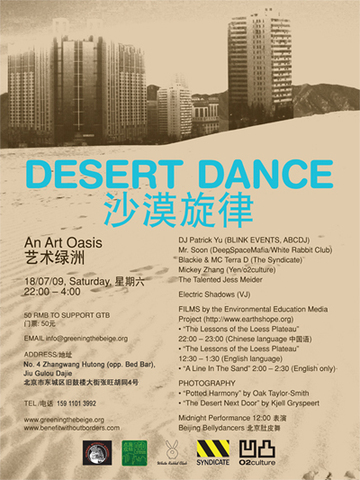 Proceeds will be used for the self-sustaining 3rd Annual Greening the Beige Event — RE-ENERGIZE BEIJING — coming this November 2009. Note that our first choice of location has now moved to No. 4 Zhangwang Hutong (opposite Bed Bar, look for the golden gate entrance), Jiu Gulou Dajie. While we are not pleased regarding the circumstance for this change, we are extremely grateful and honored to have found such a stunning and generous new home for our event, a 500 year old restored courtyard temple, located north of the drum and bell towers. If you’re planning to come or have any questions, or would just like to send us your positive feedback, love, and support, we definitely want to hear from you. ‚Til then, the oasis awaits. It is nice to be back in Beijing, meet some of my Beijing friends and have dinner in a Xinjiang restaurant. And it was cool that Jess Meider had a special concert today in the Yugong Yishan club. 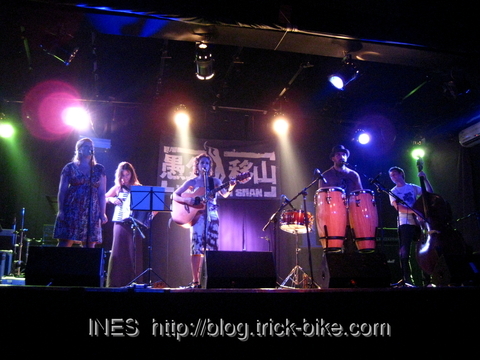 She was accompanied by Sarah (background vocals) and Zack (bongos) as well as Zacks‘ brother (standing bass) and Marie-Claude (accordion). It was a great mix. 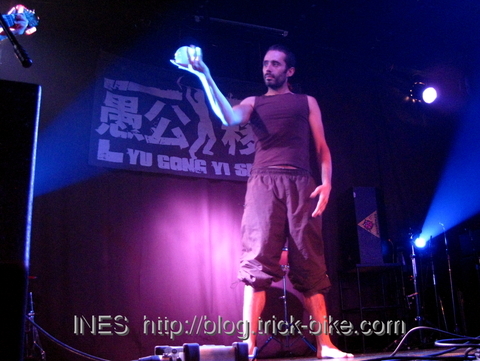 And my friend Fede performed during the Moon Song with his crystal ball. My last day in Germany was nice. It stared with a breakfast with a friend from Hamburg in the traditional „Tee-Haus“ in Erlangen. Unfortunately I forgot to take a picture. We will have to do that next time we meet. 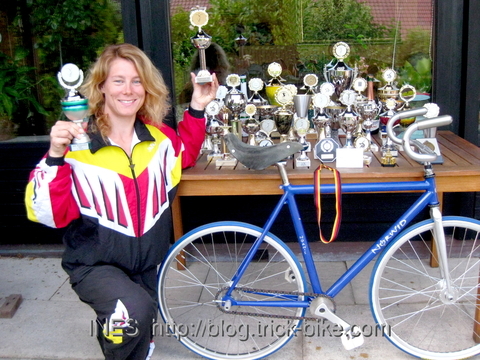 Then I went to say hi to some friends in the nearby bike shop and get some things sorted at my local bank. After that I had a very delicious goodbye dinner at home. My parents cooked fine beef roulades with Franconian dumplings, red cabbage and a variety of garden salads. That tasted so good. And then it was time to say goodbye and realize how heavy my bags were. It is good that you do not need to book a specific train in Europe, but you can take any similar connection with the same train ticket. There was one train that I wanted to get, but the time was flying and there was some probability that I could miss that one. Many discussions on what would be the best route did make us take the most efficient road so that I arrived with a comfortable 10 minutes before departure. 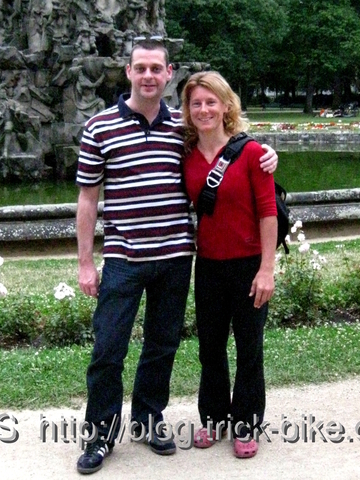 After check-in in Munich I met another friend that I have not seen for a while. He looks great like always. And then it was flying back to Beijing and arriving only 9 hours later. Herzogenaurach is famous for two brothers that continued the show making profession handed down by their father. But as they did not get along with each other they both opened their own companies – today known as Adidas and Puma. 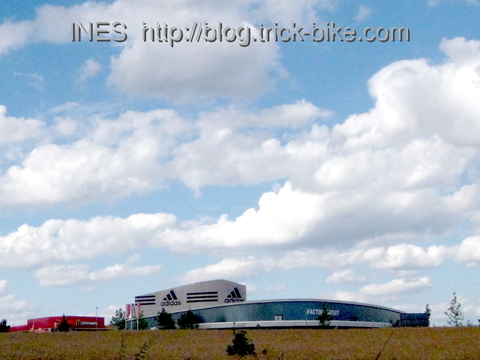 Some years ago Adidas build a factory outlet shop in the outskirts of Herzogenaurach. Many people from all over Europe drive by to get special discounts here. 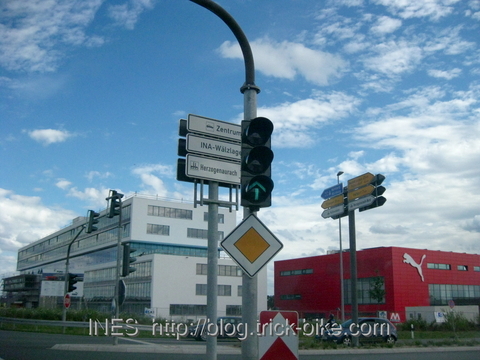 Puma of course also has a factory outlet, but is now building a huge new Puma-City. 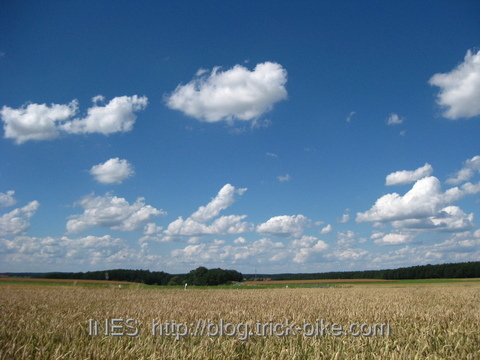 Here is a view towards the village where my parents live. 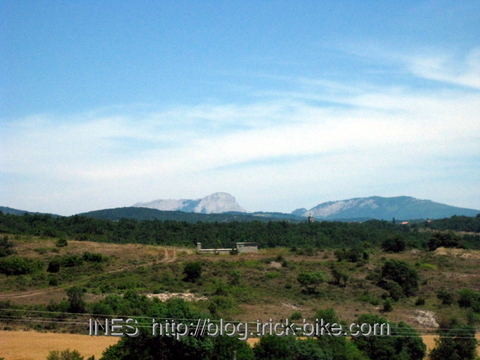 Actually most of the village is hidden in the valley behind the forest and in front of the antenna in the far distance. It was great weather today and not as cold as the past two weeks. Between doctor’s appointments I had a picnic on a meadow. 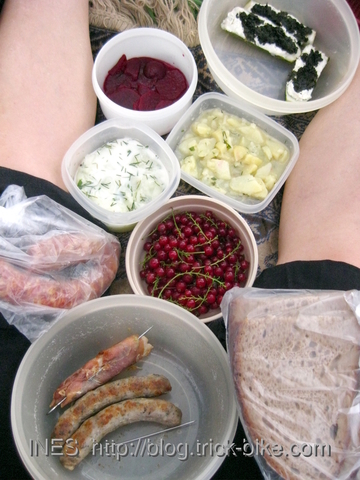 Nuremburg sausages, pepper sausages, ham wraps on a stick, filled zucchini, potato salad, red beet salad, cucumber salad, German bread and red current berries from the garden . 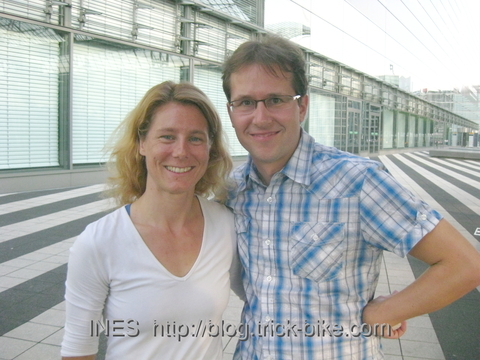 In the evening I met a friend from Berlin. I had last seen him when he visited Beijing 20 months ago. We first had some Franconian dinner (Schaeufele mit Kloessen) and then some weird named cocktails in the rain. It was nice to see him after such a while. 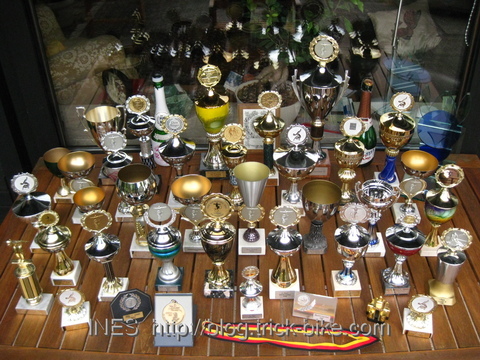 On the attic in other boxed I found some of the trophies from competitions that I participated in. I decided to take Chinese style pictures with me and my victory cups from competitions in cycling, gymnastics and even diving and skiing. 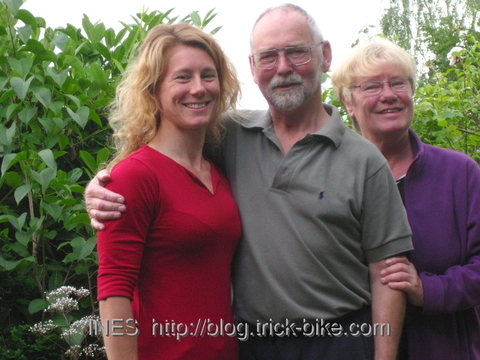 In the evening I took a picture with my parents in their garden. 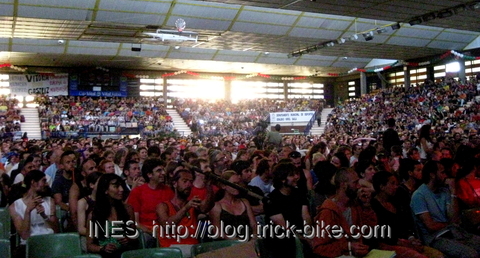 My last day at the European Juggling Convention in Spain was a quiet one. 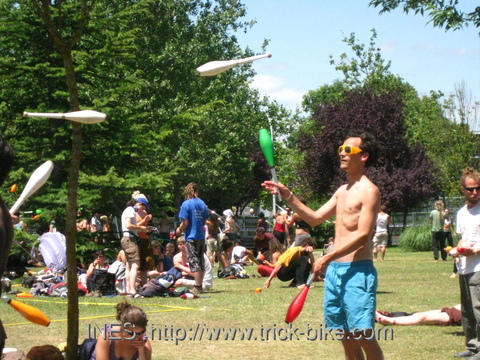 It seems everybody must have partied hard the night before as the whole juggling field was empty. And that even still at 11:30am. 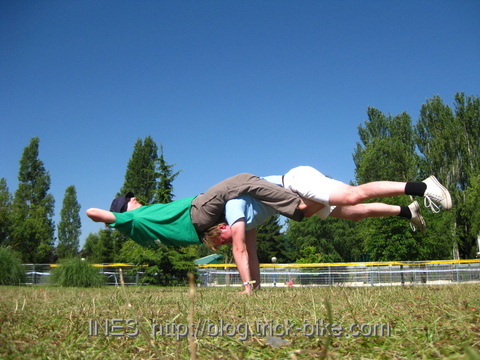 Martin and Gerhard did some partner acrobatics for me. 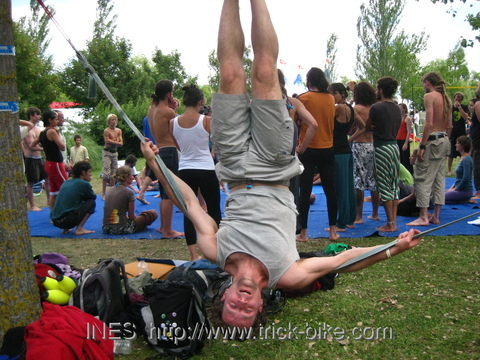 And I in return did some unicycling for Gerhard. I then had to rush to catch the Vitoria-Gasteiz urban bus to the main bus station. The bus did not come as it was posted on the schedule, but actually 35 minutes later which almost made me miss the bus to Bilbao. And if I would have missed that I do not know if I would have made it to the airport on time for my flight. But it went well. 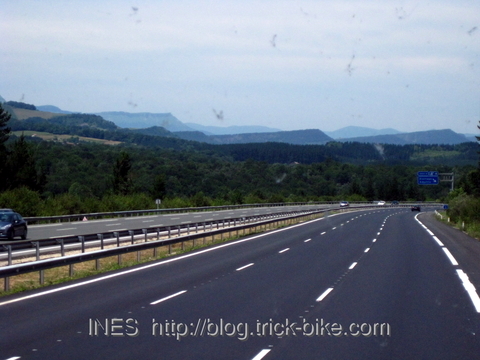 I took some pictures out of the bus window along the highway from Vitoria to Bilbao. It felt like the 1 hour on the highway was a constant downhill roll. And this was taken through the bus front windshield therefore it has so many insect smudges. In Bilbao airport they must have just had a protest. 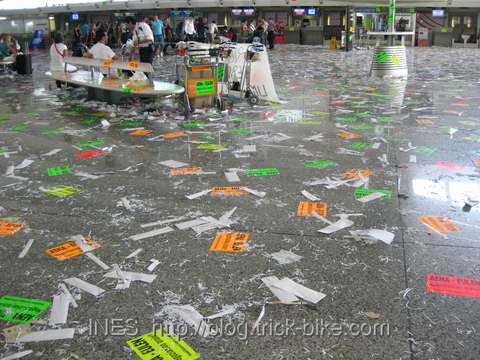 The airport looked like a mess. And there were the bright stickers (made to hardly ever go off again) sticking everywhere. They said the complete staff working at the airport wants higher wages and better working conditions. But I am not sure the working conditions of the cleaning staff will be so pleasant the next few days. 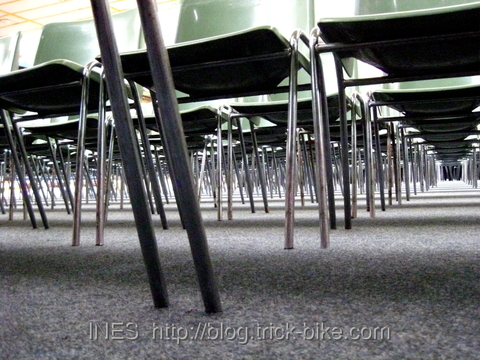 But at least the staff was not on strike and my flight back to Germany left on time. 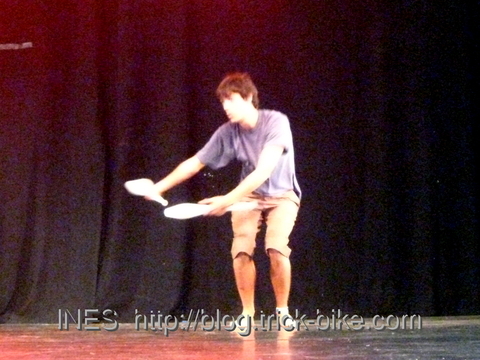 So this is why I am here in Spain: The main Gala Show of the European Juggling Convention 2009. Today I first had my own private rehearsal time on stage, then we had the complete run through the show and after that 2 shows with full halls. It was a very long and intense day. 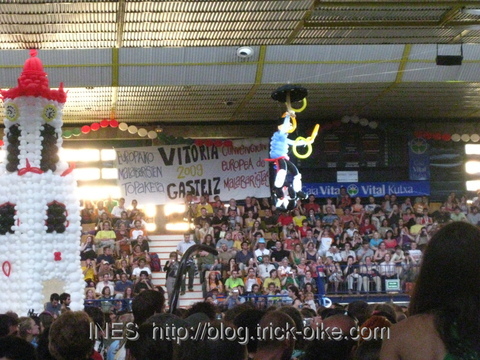 In Vitoria there is a special festival at which they have a puppet go from one tower in the city via a wire to the next tower. 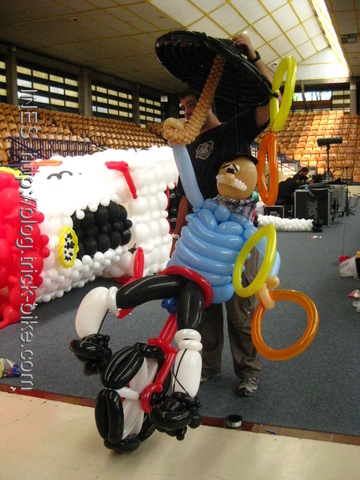 As we are at a juggling and unicycling convention they had that puppet made out of balloons and made him riding a unicycling and juggling balls. Also the tower was made out of balloons. At the beginning of each show they had this puppet fly over the audience from the city tower to the stage. 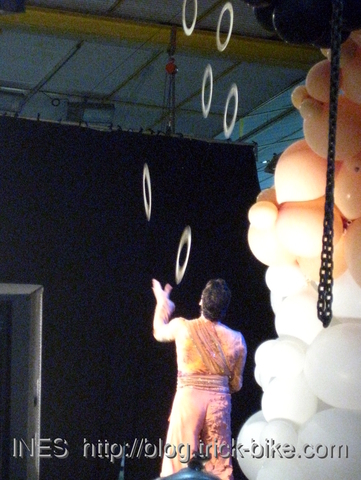 Jeanine Ebnoether and her modern beautiful body rolling contact juggling choreography. 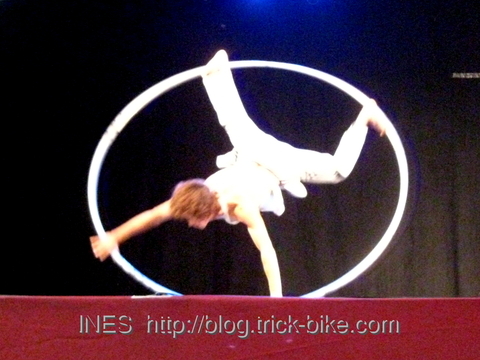 It was nice to have another woman perform in the show. And she did it so elegantly and smooth it was a pleasure to watch. 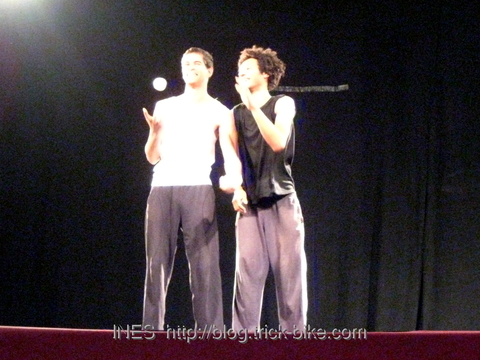 Duo DeFracto did a great modern, minimalistic and funny ball choreography. It was so well timed and performed. And this was the artists green room where we had baguette and cheese. Everybody was exhausted but satisfied after the show. I participated in the slack rope workshop. 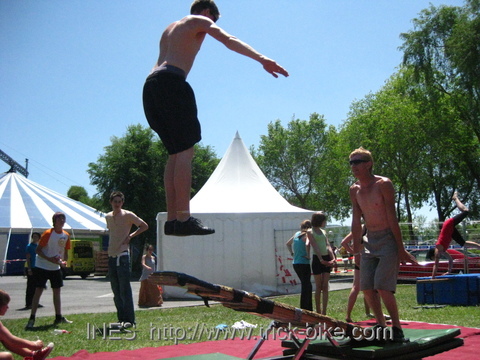 That is a slack version of the slack line. 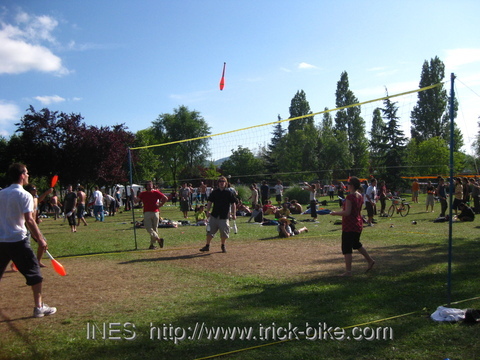 I think it is more fun than slack line. 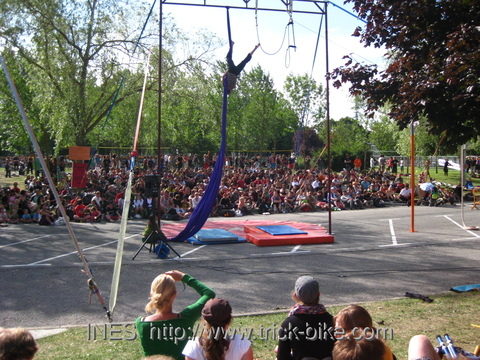 There was also a unicycle trial area with rocks and boulders to jump onto. 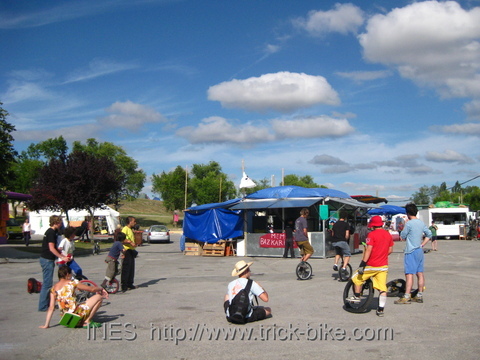 Here are some unicyclists that gathered at the main square of the EJC area. 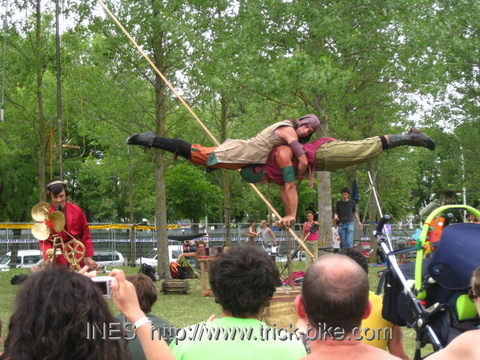 There were always some public performances going on, especially the street performer style. And finally after some hours of searching I finally found him! 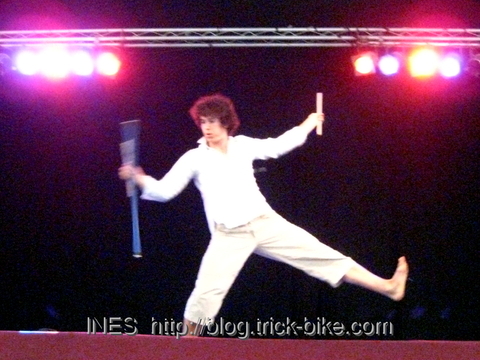 My friend Oli from Beijing who used to come to the Beijing Jugglers workshop and amaze everybody with his skills. 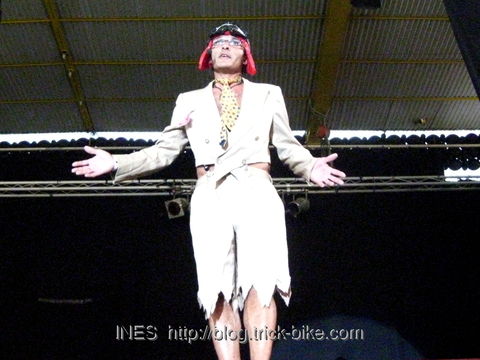 I knew he was at the EJC 2009 but without a mobile phone nor internet and everybody camping it was hard to get in contact with him. I thought I might see him somewhere as he is tall. 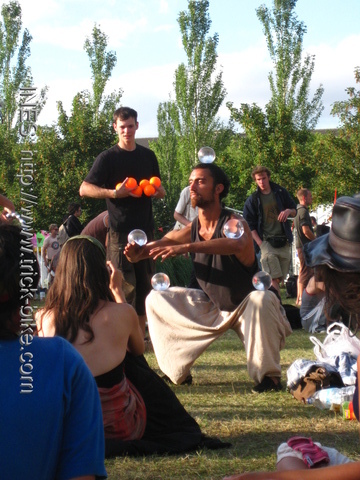 But then realized that actually a lot European jugglers are tall. After some hours of traveling I finally arrived in Northern Spain in a city called Vitoria-Gasteiz. 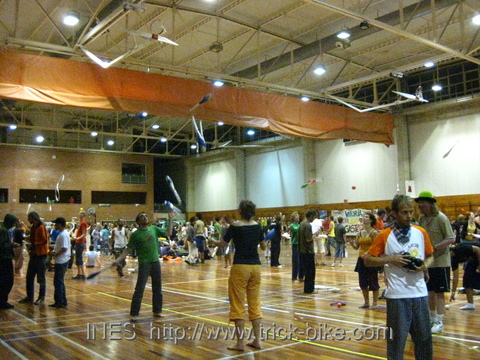 The huge European Jugglers get together is held here this year. It had started already 4 days ago. 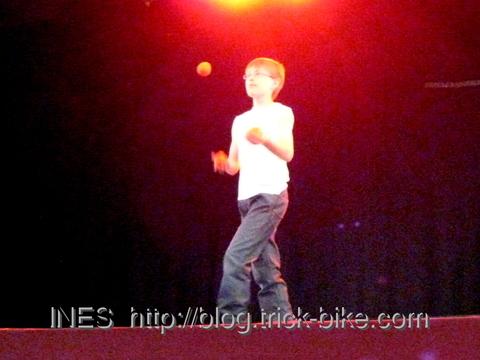 It met friends from the Erlangen juggling group as well as friends that I had not seen for about 10 years. 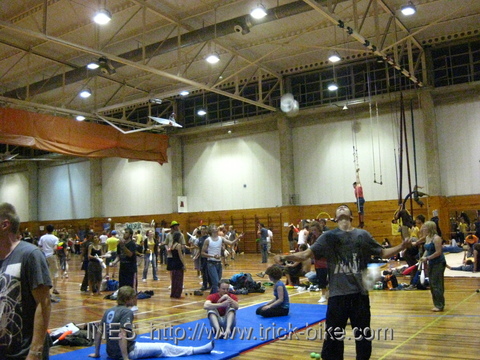 They arranged for one hall that is open 24 hours to do whatever you want: Some people participate in the juggling combat, others do passing or practice juggling balls and others do trapeze or partner acrobatics. Like me. 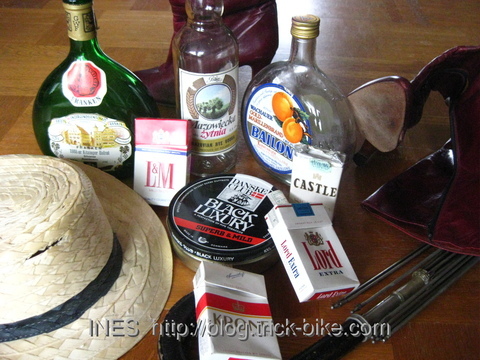 This morning I packed up my trick bike into my bicycle travel bag and got my things ready for my trip to Spain. 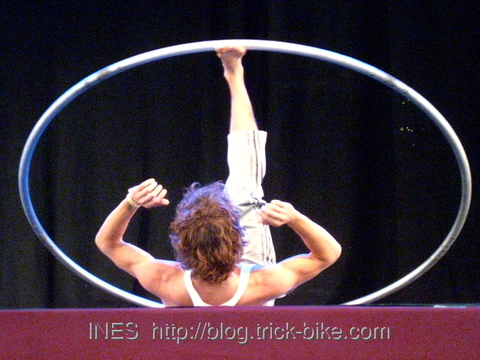 The flight is actually shorter than all the travel by buses to get from the airport to the venue where I am booked to do trick bike performances. 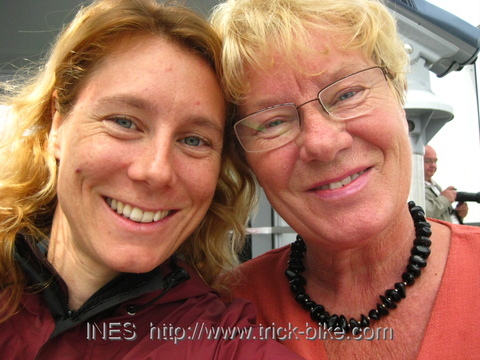 Here is a goodbye picture with my mother. 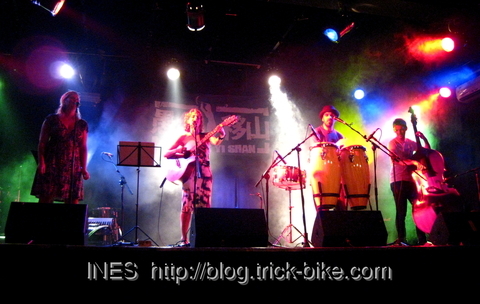 You are currently browsing the China, Asia, Climbing and Fixed Gear Bikes blog archives for Juli, 2009.